Termites, also known as white ants, can do a lot of damages your property by compromising your property’s structural. This will leave a significant dent to your wallet if it is not treated correctly. The damages can cost a lot more if the infestation is allowed to prolonged. In the United States alone, property owners are said to spend 5 billion dollars on the repair! They are the number one pest that most property owners fear after bed bug. Use pest control services in Singapore from a reputable pest control company like Innovative Pest Management instead of DIY termite control. While it is good to know and learn what you are dealing with, taking a chance on solving the issue yourself is not recommended. It still takes years and experience to correctly use the right treatment for them. Our termite control package depends on what type of termites is infesting in your property. We always start off with a proper inspection look for signs of termites, understand how bad the infestation and implement the correct treatment for your property. They are many termite treatment methods available today. Let us touch on the termite control services for each one of them. For subterranean infestation, using termite bait is the best form of treatment for them. The main reason for this is to ensure that they are still alive and active to bring back the baits to the queen and colony. This slow acting method is effective because it will not kill them on the spot such as spraying. As they are social insects, they tend to share their food. Feeding them the baits will ensure that the baits will be shared in the termite colonies. Read our 4 reasons why termite baiting is effective for subterranean or you can choose to understand more about termite baiting here. Phase 1: Weekly treatment till eradication. Each treatment consist of monitoring or replenishing the baits station. Ranges from 4-6 weeks. Could be longer depending on the infestation level. A thorough inspection is done during this session to check for sign on any infestation. Should any termites activity is found, phase 1 will start again. While a bait system works well for those properties with an infestation, an anti-termite treatment is a prevention control treatment. A barrier is formed around the perimeter of the property. Property with concrete slab around the house, holes need to be drilled to get to the soil area of a property. Those without, a lateral rod will be pushed into the soil area. This process is called rodding treatment or soil treatment. By treating the soil with termiticide, it will repel them from entering your premise. Read more in our soil and corrective termite treatment page. Step 1: Thorough inspection to check for any infestation. If any infestation were to be found, the current infestation will need to be treated first. Proceed with the treatment. Check our procedure here. Should any infestation found during this period, the baiting program will start to eradicate the infestation. Liquid appliance is also a popular type of treatment. 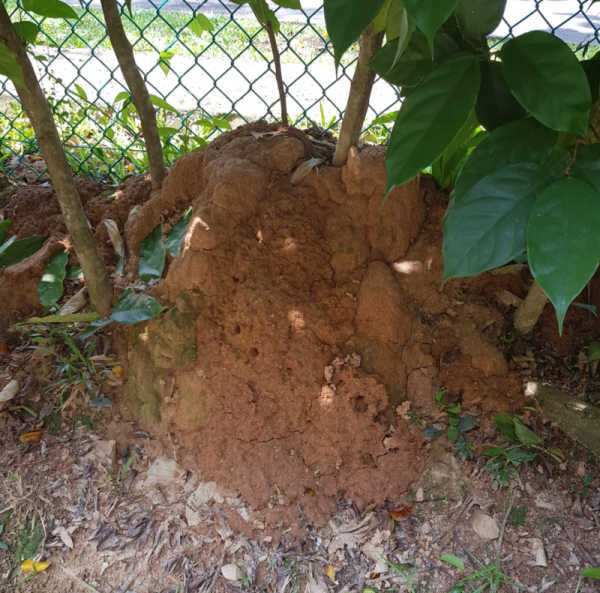 As we are basing our treatment and finding mainly for termite control in Singapore, where Coptotermes gestroi ( a type of subterranean termite species ) account for about 70-80% of the cases here in Singapore, there are many other species of subterranean found in Singapore. Liquid termiticide can be used to treat some of them. One such example will be the Macrotermes carbonarius. This is how the termite mount looks like. The video above shows how the termite mount is being treated. The treatment consists of injecting termiticide into the mount. Some items can be treated by using a fumigation service. Arrangement needs to be made to bring the items over to a fumigation warehouse. Fumigation is highly toxic but the most effective treatment for dry wood. Unfortunately, not all items can be treated with fumigation. Fixtures such as build wardrobe, kitchen cabinet, cannot be dismantled. And even if they can, it does not make any sense to do so. For infested fixture structures such as door frame or really big items that are not easily shifted around, alternative treatment such as foam or chemical spraying can be chosen. Our technician will drill holes to the affected area to soak the affected wood. This will kill them when they come in contact with the treated wood. Misting treatment will leave a residual on the affected and potential area. Especially during the swarming season, more termite alates will start flying in to start a new harbouring area. The residual treatment will prevent more the alates from forming a new colony in your property. A cycle of 3 to 5 rounds of treatments is needed to bring the infestation down. Dampwood treatment is quite similar to that of a drywood colony. If their nest or infestation is not in contact with the ground, liquid termiticide spraying is the best form of treatment. However, if their nest is on the ground, rodding will be advisable. As they required a high level of moisture, it is uncommon to find them in the trees that are decaying or rotting. Ranges from 1- 2 weeks with follow up needed.